Born in Boston, Massachusetts on January 17, 1706, Benjamin Franklin was one of seventeen children. His father had intended for Franklin to become a clergyman but could only afford to send him to school for one year. Since Franklin enjoyed reading, his father sent him to apprentice with his brother James, a printer. After helping James with the grueling work of composing pamphlets and setting type, twelve-year-old Franklin would sell their products in the streets. His brother started The New England Courant, the first newspaper in Boston, when Franklin was fifteen. James was not grateful to his younger brother and administered beatings from time to time. In 1723, Franklin decided to leave, and took a boat to New York where he hoped to find work as a printer. He was unable to secure employment, and walked across New Jersey, finally arriving in Philadelphia via a boat ride on October, 6, 1723. In 1729, Franklin bought a newspaper, the Pennsylvania Gazette. He not only printed the paper, but often contributed pieces to the paper under aliases. His newspaper soon became the most successful in the colonies. On May 9, 1754, this newspaper published the first political cartoon, created by Franklin himself. 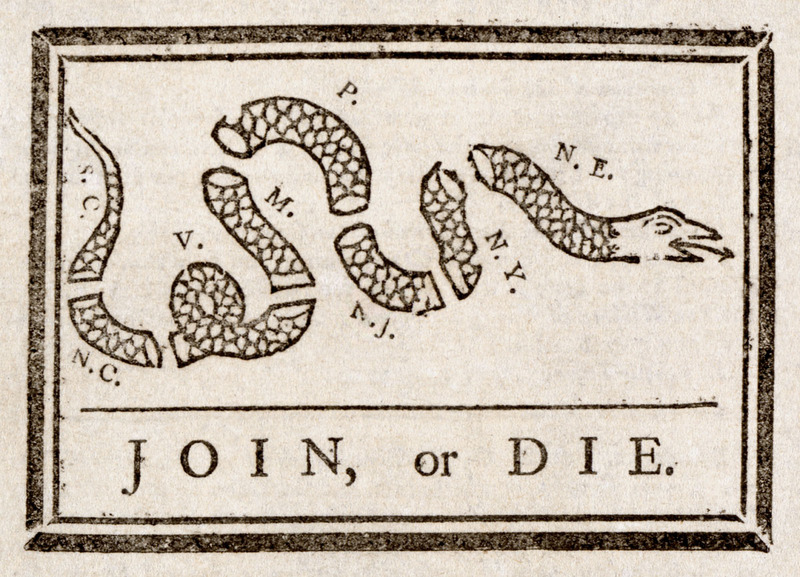 The cartoon, “Join or Die,” illustrated the importance of union by comparing the colonies to pieces of a snake’s body. With the threat of an impending invasion, eventually the French and Indian War, intercolonial cooperation was critical. This cartoon has been reprinted and redrawn widely throughout American history. Variations of the piece has had alternate texts, like “Unite or Dead,” or relabeled segments, depending on the political bodies being appealed to. During the American Revolutionary War, the image became a potent symbol of Colonial unity and resistance to what was seen as British oppression. It reappeared during the American Civil War, and was suitably redrawn by both the North and the South. 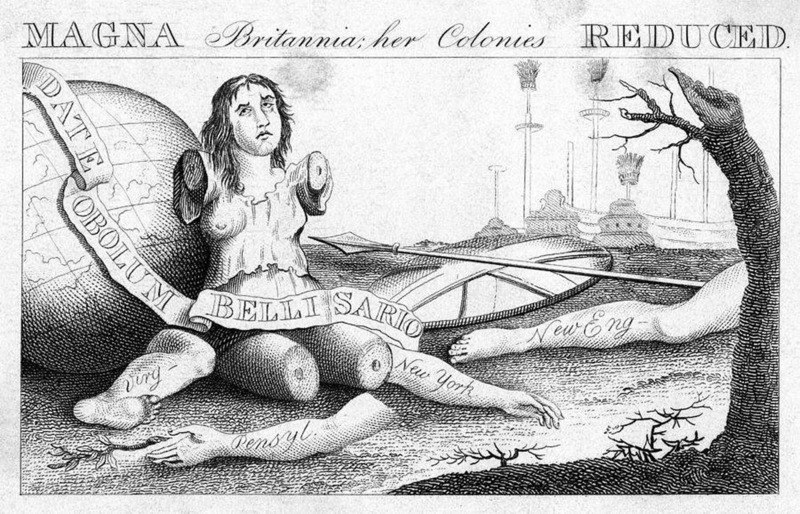 In opposition to the Stamp Act, Franklin created a new cartoon “MAGNA Britannia: her Colonies REDUC'D.” His engraving depicts the image of the female figure Britannia with her limbs cut off, symbolizing the danger of England losing her American colonies through oppressive taxation. Franklin, Benjamin. The Way to Wealth. Bedford, MA: Applewood Press, 1758. Franklin, Benjamin. Works of the Late Doctor Benjamin Franklin: Consisting of His Life Written by Himself, Together with Essays, Humourous, Moral & Literary, Chiefly in the Manner of the Spectator. London, England: G.G.J. and J. Robinson, 1793. Isaacson, Walter. Benjamin Franklin and The Invention of America: An American Life. New York: Simon & Schuster, 2003. Lemay, J.A. Leo. The Life of Benjamin Franklin. Philadelphia, PA: University of Pennsylvania Press, 2005.